At CORE we have always valued creativity, art, and visual thinking. Recently, we’ve been experimenting with an “artists in residence” model, a partnership with Julie Swanson and Stephanie Steigerwaldt of What’s Possible Now. 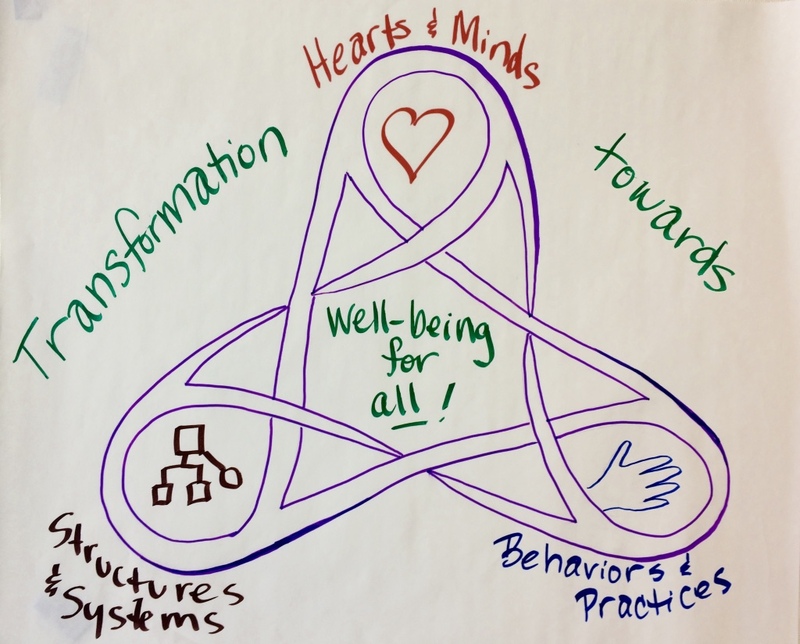 Steph, Julie, and colleagues Nola Walker, Tina Abert, and Mary Michaud are expanding our community’s capacity for fun and collaborative engagement by deepening their skills in the use of graphics for group meeting processes. 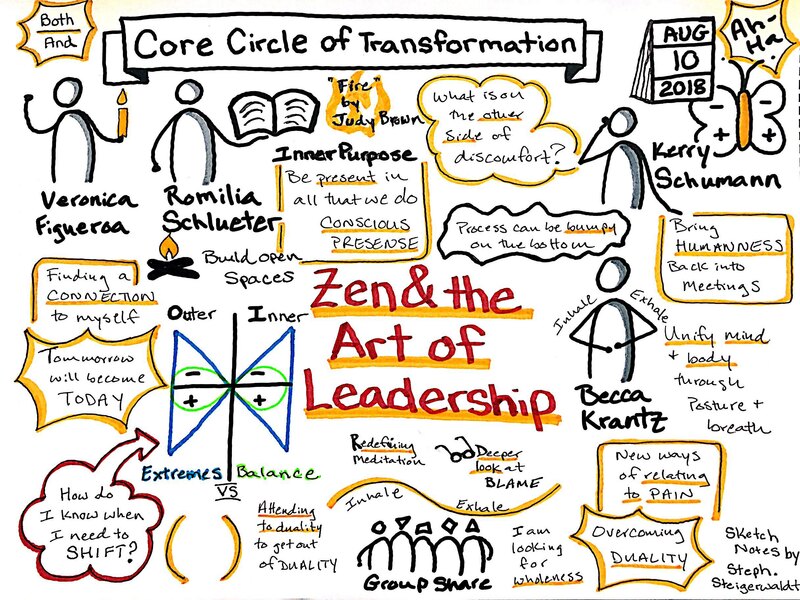 A host of related techniques are emerging in the field, which go by various names: graphic recording, sketchnoting, graphic facilitation, generative scribing. As a visual thinker and learner, I’ve been drawn to this kind of methodology ever since I was first introduced to it by my friend and colleague Mary Sykes, when she was the graphic recorder for a PATH planning process for a member of my family. This “person-centered planning” process brings together a circle of support around a person with a disability to help them “Plan Alternative Tomorrows with Hope.” On a huge piece of paper, this circle of care captures in beautiful, colorful, playful sketches and key words a plan for a path forward. Later, the image is resized to provide an easy map for everyone to refer to. (Here’s an example of a PATH plan with the person’s name removed for privacy). I was intrigued to learn that a similar process can be used for organizational planning, and I eventually went to a training in graphic facilitation conducted by The Grove in 2014. 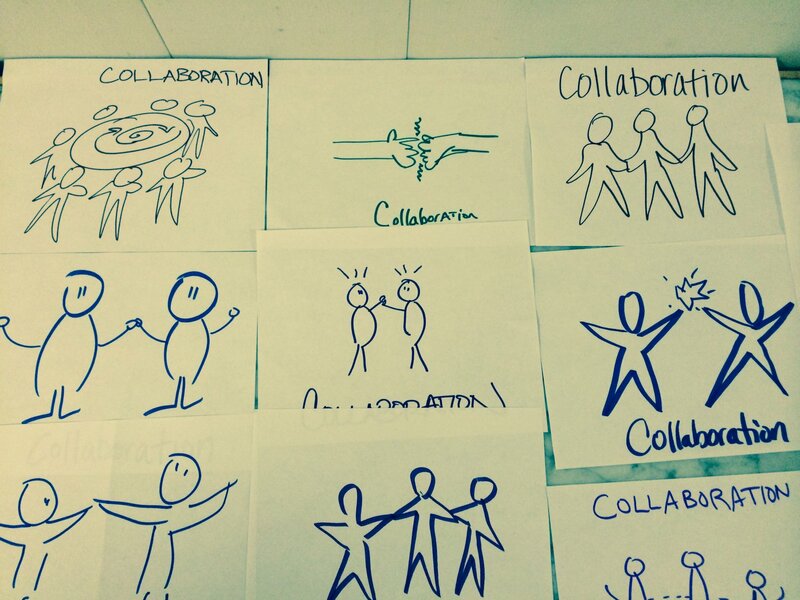 Over the years, CORE has used graphic facilitation and graphic recording in a variety of ways. In our “Match for Change” program where we did match-making between organizations and consultants, we created graphic summaries of what we learned about each consultant and organization and used these images to assist our selection of three good-fitting consultants to recommend to each organization. 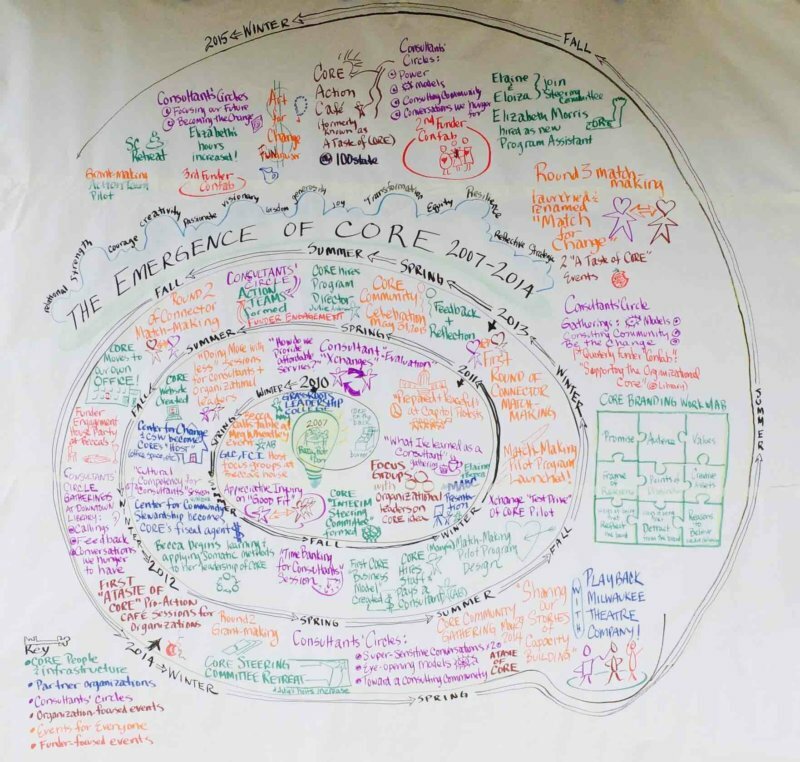 We also used these hand-made graphics to summarize CORE’s history in a giant spiral timeline, for this “triple-mobius” version of our understanding of the relationship between inner and outer change, and for many internal planning processes. Now, our “artists in residence” are creating graphic versions of our Circle gathering “touchstones” and capturing key themes of our circles with visual note-taking. As part of this partnership, CORE has supported them with an honorarium and financial assistance to attend trainings. Steph, Julie, and Nola will be sharing more about their graphic learning journey soon in an upcoming blog and at our October Circle. Stay tuned!